越来越好的KAI-08051图像传感器 - 安森美 - 中国电子技术论坛 - 最好最受欢迎电子论坛! Everyone hopes for it, in one way or another – things to be a little better than they were before. Parents want a better life for their children. Workers want a little more in their paycheck. And fans of sports teams want at least a few more wins than last year. It’s a basic drive of human nature – looking to make things better than they were before, and striving to find ways to make that happen. For manufacturers and users of Industrial cameras, things have definitely gotten better now that Truesense Imaging has joined the ON Semiconductor family. We’re excited about the new opportunities we can address as we work together to provide the most advanced image sensors for high-performance imaging markets - whether based on the superior image quality available from CCD technology or the flexibility and frame rate coming from CMOS. But even as we combine our imaging portfolios, we continue looking for ways to develop new products – or enhance existing ones – to better meet our customer’s needs. These improvements can come in a variety of ways, ranging from the launch of a new product platform (like the PYTHON family of CMOS image sensors, or our 12 and 6 megapixel CMOS devices) to leveraging existing technology to develop a new family of devices with superior image quality (like our new 7.4 µm CCD image sensors). But sometimes the best path is to just take something that’s already good and make it a little better. For example, look at our new KAI-08051 Image Sensor. As the latest member of the TRUESENSE 5.5-micron Interline Transfer CCD Platform, this 8-megapixel CCD shares the same 5.5 micron pixel architecture and high imaging performance as other members of this family. But now we’ve included an updated amplifier to reduce read noise by 15%, newly-optimized microlens structures to increase Quantum Efficiency (over 10% for monochrome devices), and new color filter materials to capture more accurate colors. The result? 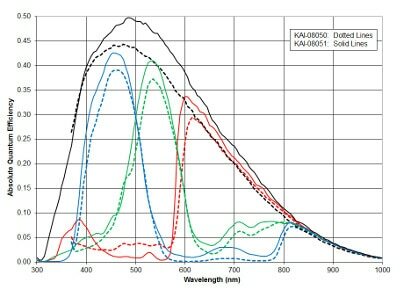 A sensor that’s backwards compatible with the existing KAI-08050 Image Sensor (so manufacturers can easily incorporate the new device into their existing camera designs) but provides better performance, particularly under low-light conditions. Standing still is never an option. As the imaging requirements of our customers continue to advance, we understand the need to keep improving and enhancing our product portfolio in order to remain a leading supplier of high performance image sensors. While the underlying technology can be complex, the end goal is very straightforward – a portfolio of products that provides new features to solve new problems. A portfolio that keeps getting better. GMT+8, 2019-4-23 20:45 , Processed in 0.164129 second(s), Total 39, Slave 27 queries , Memcache On.